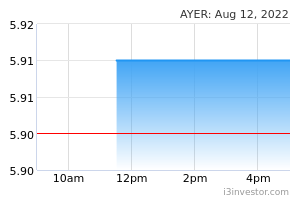 AYER Holdings Bhd is a Malaysia-based investment holding company. The principal activities of the company and its subsidiaries are categorized into two segments, namely Property development and Plantation. Its Property development segment is engaged in developing residential and commercial properties. Its Plantation segment is involved in cultivating oil palm. charmingplus If it going down to rm2.50, I will buy it few million units. Buying it like no tomorrow. charmingplus below rm2.50, can easily own millions of unit. waiting for cheap buying spree. athlon64 it lower limit capped price at 8.x , i dont think it will drop below the price. charmingplus if it ever drop back to rm8, this share is still extremely Cheap to invest compared those expensive share like BAT, NESTLE. but still ppl invest in BAT, NESTLE, DUTCHLADY because share price is very strong and moving up, company making lots of profit plus very high dividends. Very very very worth to buy. I will accumulate lots of fund to eat up millions millions of unit once it is getting cheaper. charmingplus Imagine NESTLE in the 1990s, just only above RM10, same as BAT. Look at the price now, so very expensive and no many can afford to buy it. BAT, NESTLE becomes LV expensive high class brand. Only the very super rich can afford to own. thefarside the company has load of cash and shareholders are in their late years. what do you think will happen? this company will be attractive to raiders. hence, day trading as short term measure. and long term, will have to wait and see what they plan to use the cash for. charmingplus They already got their succession plan, their CHILDREN be taking over the helm of the company. charmingplus Actually no worries on the elderly shareholders as the oldest only 64 years now. genting boss work till died at 90s.year old. long long long way to retirement. charmingplus Buy buy buy buy buy once drop below rm2.50. athlon64 impossible to keep rising again after received UMA from SC. how12345 Going to be hot again. charmingplus Write to SECURITY COMMISSION (SC) to make a complaint why BURSA MALAYSIA the simply issued UMA to a good track record company which is Malaysia 107 years old company. going down down down to RM2.50, Can buy up millions unit of share then. Blessing in disguise, can really buy a lot of units. charmingplus very good OPPORTUNITY TO BUY CHEAP SALE SHARE. PN17player now is 0not the time to enter yet, it will still drop further. charmingplus Nobody going to know how far be dropping because it is all depend on market sentiment. If without support, I believe it will drop below RM2.50. If that happen, many investors can buy so many units CHEAPLY. But Tahps no more Water Face, a company making profit more than 200% plus a dividend issued, price dropping like hell, bad bad bad image for this company. There dropping freely down good for all investors can buy lots of shares so cheap. It is like cheap sale discounted to 90%. Of couse, every INVESTORS looking for good company with cheap price. Hope Tahps gives special offer below rm2.50. charmingplus Many good companies once announced high DIVIDEND, very certain the share price shooting up up up for INVESTORS buying big volume to lock up DIVIDEND entitlement. But for Taphs is acting strangely for price downward. For any company issuing good profit and dividend and share price unable move forward but Dwindling down is Extremely Bad Luck and Bad Omen for this company. charmingplus I target to buy like crazy once reached RM2.50. how12345 How could it possible reach rm2.5 ? Funtrade lysadd, SAB and TAHPS same company. sean88 Ppl, pls run out from this share... lets see how simctgal can handle it... he sounds overconfident and over estimated on his calculation... Dont get fool by him, Investor! losing why this stock so quiet? -Very illiquid counter but very solid company. Therefore, well positioned to pursue value accretive acquisitions or return more cash to shareholders or it could be a potential privatization candidate. -Undemanding valuation with strong netcash position, netcash is around Rm134,133,000 as at 31 March 2015. -Netcash per share is around Rm1.79, accounted for 26% of its current share price. -It holds land bought at low prices. -Proposed a first and final single tier dividend of 32 sen per share in respect of the financial year ended 31 March 2015, share price should be supported by dividend yield ^4.7%^. Rica7894 An Awakening Gem Waiting To Be Unearthed Which Can Worth RM12.33 Per Share. Buy Call In Long Term. TAHPS owns ****353acres of freehold vacant land**** in Bandar Bukit Puchong, Puchong, Selangor since 1993. Currently net book value of the 353acres land showed at financial year ended 31 March 2014 is Rm 63,439,000. It sits on the balance sheet or book value at RM179,717 per acre or at Rm 4.12 per sq ft. According by valuers, the market value for the above vacant land currently is worth between Rm60 to Rm120 per sq ft or between RM2,613,600 to RM5,227,200 per acre. This shows that TAHPSs ~353acres of prime landbank in Bandar Bukit Puchong, Puchong worth between RM922,600,800 to Rm1,845,201,600. It sees deep underlying value in the company as its 353acres of freehold vacant land already could worth at least RM RM922,600,800 or RM12.33 per share with issued and paid-up capital Rm74,853,000. (74,853,000 ordinary shares of Rm1 each). TAHPS is an asset play. The company’s balance sheet and operating cash flows are healthy, solid and with zero borrowings . Though there is no dividend policy but the payout does seem attractive currently. Expects a DPS of 32sen to be announced soon. Lam7894 A potential privatisation candidates with a net yield of 4.6% at the prevailing price of Rm6.90. Declared DPS of 32sen per share single tier tax exempt , ex-date will be 4/8/15. 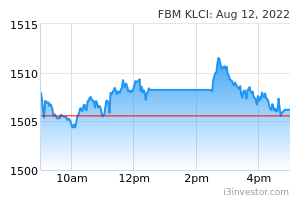 The stock is in an uptrend with support at Rm6.80 to Rm7.00. Livermore 17,800 small volume can push the price up so much, who is buying? I wonder, or only merely movie only? SniperElite It is going to get a whole lot worse before it starts to get better. The trend now is sell and everything else is sliding ... bad time to buy. Prophet Why buy at $6.13 when you can buy it at $5.50? SniperElite http://www.thestar.com.my/business/business-news/2017/03/28/tahps-group-to-launch-rm100m-gdv-project-in-q4/ Opportunities and Growth here. SniperElite This is very good news for TAHPS - share price will skyrocket very soon. kengpc can someone tell me when was ayer hitam changed name to tahps and what is the ratio of exchange of shares if any.....thanking you in advance. Rusli Widad AYER Holdings Bhd, which has undergone a rebranding exercise from TAHPS Group Bhd, is in the midst of restructuring its master plan for Bukit Puchong. The group will be looking at launching landed and non-landed properties this year, while also working on adding recreational, education and healthcare components to enhance the value of their township. dompeilee Wow...I never thought I could get shares of the famous Ayer Hitam Planting Syndicate(which hit $60 in the go-go 1990s) for below $4.60, a full 20% BELOW my entry in end-2013 of $5.6533 average, which I eventually sold from 6+ all the way up to $9.20 after collecting a 35c dividend. LouiseS This company share still overpriced, PE at ~25, divdend also decreased significantly compared to last few years, decreased from around 30sen to now 5sen.